This is the first episode of a 113 part program I originally recorded in 1999 as a webcast, when such events were cutting edge, technologically. All these years later, it remains my best and most complete description of the Dramatica Theory of Story Structure and covers all key concepts and how to apply them to your novel, screenplay or any form of expression in fiction. Though our understanding of the nuances and ramifications of the theory have grown in time, all the essential notions have remained unchanged, and are just as valuable and useful today as when I sat in front of my massive CRT monitor and shared them with my internet audience from my living room. With this short glimpse into the past to set the stage, here is a textual exploration of the material covered in this first episode, informed by fifteen additional years of exploration and familiarity with the theory. When we write a story, it takes on a personality of its own, as if it were a real person in its own right. There is a reason for this. Every character represents a different aspect of our own minds, so when they all come together in a story, it begins to act like us, influenced by all those conflicting facets that determine our overall motivation and behavior. From a theory stand point it is a bit more complicated than that. Each of us has the same basic attributes: reason, skepticism and conscience, for example. We use them all to try and solve problems and maximize happiness in our everyday lives. When we come together in a group toward a common purpose, we gradually self- organize until one person emerges as the voice of reason, another as the skeptic, and another as the conscience of the group. This is just good survival strategy because if each of use becomes a specialist, collectively the group will be able to see the problem (and potential solutions) far more clearly than if everyone sat around doing all the same jobs as general practitioners. As it turns out, since member of a group come to play the role of just one part of ourselves, the group as a whole becomes something of a fractal mind - a larger version of what goes on in our own head and hearts. Our breakthrough that led to the Dramatica theory was a Eureka moment in which we realized stories weren't just about people trying to accomplish something, but that the full complement of characters created a greater mind - a Story Mind that had just as much of a personality as any individual. That, of course, is a gross simplification appropriate to this introduction. In truth, it took us three solid years of full-time effort (from 1991 to 1994) to take that insight, use it as a filter through which to examine the conventions of story structure and then document and clarify all of the aspects of human psychology they illuminated. 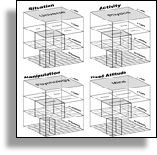 The end result was a conceptual model not only of story structure, but of the human mind itself. By 1994, we had converted our model into equations and algorithms that described the relationships among human thought processes, and implemented them in software as a Story Engine that became the Dramatica line of story development products. Very complex, to be sure! But the important element is the simple understanding that in real life,people come together in groups and self-organize as a larger model of the mind in which each plays a role, and that the conventions of story structure reflect this in the individual characters and, collectively, in the overall personality of the story itself. I’ll be adding notations like this to more of these videos from time to time as an unadvertised special - just a little bonus to share what I’ve learned over the years and, hopefully, to help you better understand your story’s structure and how to build it.